The weather on the fishing grounds has continued to be impressive, the winds have been minimal, and the seas have been flat. This calm water has given us all the opportunity to experience good fishing and witness impressive wildlife displays. As I was driving out to the halibut grounds the other day, I noticed something odd in the tide line, and quickly came to realize that it was a Humboldt Squid. I turned the boat around and we got a better look at the dead creature; it was in good shape so we scooped it up with my net. This thing was huge!! We could barely fit it in the net. It took 2 of us to lift it into the boat. After analyzing the fascinating carcass we cut out the beak and tentacles, then discarded the rest back into the tide line. 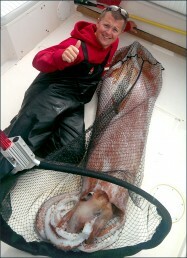 The tentacles worked awesome for halibut bait, and the beak will dry out and be a good keepsake. The baitfish have continued to be plentiful, and the Humpbacks continue to cruise the inshore fishing grounds feeding. Lately, I have found myself following the whales around, as the Humpbacks follow the bait, there are usually fish in the area as well. The entire west bay of Bird Rock 2 up into Yatze bay was stacked full of bait today. This led a couple of our boats to experience some pretty consistent fishing and some good whale shows. There is now only one month left of this season, and me and my friends up here start to enjoy each day more and more as the count towards the end of another great season slowly comes to an end. Hi guys, this is a Robust Clubhook squid. They are solitary and live at about 500m depth. The Humboldt squid are smaller, and are found in schools. Thanks Chris for this information! It’s definitely out of our realm of relevant fishing knowledge but most fascinating! We find a few (2-4) every summer and this one is the largest I’m aware of. We have found them with missing tentacles and often with what looks like large bite marks or actual “bites” missing from the tube. What predator would be interested in tackling one of these?